but none of these appear to be true empty cells, I'm guessing because they are the result of a formula. Is there any way to populate a cell if and only if some condition is met and otherwise keep the cell truly empty? EDIT: as recommended, I tried to return NA(), but for my purposes this did not work either. Is there a way to do this with VB? EDIT: I am building a worksheet that pulls in data from other worksheets that is formatted to the very specific demands of an application that imports the data into a database. I do not have access to change the implementation of this application, and it fails if the value is "" instead of actually empty. You're going to have to use VBA, then. You'll iterate over the cells in your range, test the condition, and delete the contents if they match. Excel does not have any way to do this. The result of a formula in a cell in Excel must be a number, text, logical (boolean) or error. There is no formula cell value type of "empty" or "blank". One practice that I have seen followed is to use NA() and ISNA(), but that may or may not really solve your issue since there is a big differrence in the way NA() is treated by other functions (SUM(NA()) is #N/A while SUM(A1) is 0 if A1 is empty). It is possible to have an annihilating formula evaluating to trueblank if condition is met. It passes the test of ISBLANK formula. Step 1. Put this code in Module of VBA. The above formula in B2 will evaluate to trueblank, if you type 0 in A2. You can download a demonstration file here. 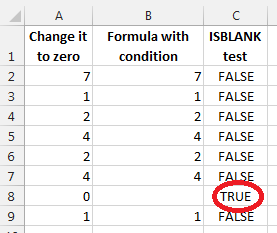 In the example above, evaluating formula to trueblank results in an empty cell. Checking result with ISBLANK formula results positively in TRUE. This is hara-kiri like formula. The formula disappears from cell when condition is met. The goal is reached, although you probably might want the formula not to disappear. You may modify the formula to return result in adjacent cell, so that the formula will not kill itself. See how to get UDF result in adjacent cell. Maybe this is cheating, but it works! I also needed a table that is the source for a graph, and I didn't want any blank or zero cells to produce a point on the graph. It is true that you need to set the graph property, select data, hidden and empty cells to "show empty cells as Gaps" (click the radio button). That's the first step. This does give the required graph with no points when an invalid cell value occurs. Of course this leaves all cells with that invalid value to read #N/A, and that's messy. To clean this up, select the cell that may contain the invalid value, then select conditional formatting - new rule. Select 'format only cells that contain' and under the rule description select 'errors' from the drop down box. Then under format select font - colour - white (or whatever your background colour happens to be). Click the various buttons to get out and you should see that cells with invalid data look blank (they actually contain #N/A but white text on a white background looks blank.) Then the linked graph also does not display the invalid value points. This is how I did it for the dataset I was using. It seems convoluted and stupid, but it was the only alternative to learning how to use the VB solution mentioned above. I did a "copy" of all the data, and pasted the data as "values". Then I highlighted the pasted data and did a "replace" (Ctrl-H) the empty cells with some letter, I chose q since it wasn't anywhere on my data sheet. Finally, I did another "replace", and replaced q with nothing. This three step process turned all of the "empty" cells into "blank" cells". I tried merging steps 2 & 3 by simply replacing the blank cell with a blank cell, but that didn't work--I had to replace the blank cell with some kind of actual text, then replace that text with a blank cell. set the number format for the cells like so, where you will have to come up with what you want for positive and negative numbers (the first two items separated by semi-colons). In my case, the numbers I had were 0, 1, 2... and I wanted 0 to show up empty. (I never did figure out what the text parameter was used for, but it seemed to be required). Try evaluating the cell using LEN. If it contains a formula LEN will return 0. If it contains text it will return greater than 0. Wow, an amazing number of people misread the question. It's easy to make a cell look empty. The problem is that if you need the cell to be empty, Excel formulas can't return "no value" but can only return a value. Returning a zero, a space, or even "" is a value. So you have to return a "magic value" and then replace it with no value using search and replace, or using a VBA script. While you could use a space or "", my advice would be to use an obvious value, such as "NODATE" or "NONUMBER" or "XXXXX" so that you can easily see where it occurs - it's pretty hard to find "" in a spreadsheet. As requested, if you actually want a formula that returns an empty cell. It IS possible through VBA. So, here is the code to do just exactly that. Start by writing a formula to return the #N/A error wherever you want the cells to be empty. Then my solution automatically clears all the cells which contain that #N/A error. Of course you can modify the code to automatically delete the contents of cells based on anything you like. Open the "visual basic viewer" (Alt + F11) Find the workbook of interest in the project explorer and double click it (or right click and select view code). This will open the "view code" window. Select "Workbook" in the (General) dropdown menu and "SheetCalculate" in the (Declarations) dropdown menu. NB: This process is like a scalpel. 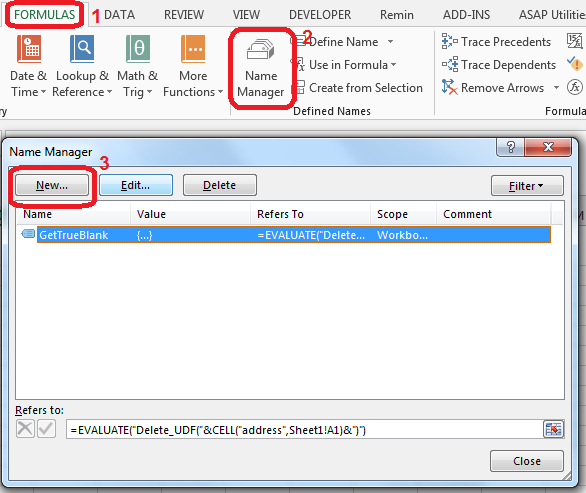 It will remove the entire contents of any cells that evaluate to the #N/A error so be aware. They will go and you cant get them back without reentering the formula they used to contain. Use COUNTBLANK(B1)>0 instead of ISBLANK(B1) inside your IF statement. Unlike ISBLANK(), COUNTBLANK() considers "" as empty and returns 1. This answer does not fully deal with the OP, but there are have been several times I have had a similar problem and searched for the answer. If you can recreate the formula or the data if needed (and from your description it looks as if you can), then when you are ready to run the portion that requires the blank cells to be actually empty, then you can select the region and run the following vba macro. When you make any calculations the "" will give you error so you want to treat it as a number so I used a nested if statement to return 0 istead of "", and then if the result is 0 this equation will return ""
I don't know if this works with other functions...I haven't tried. I am using Excel 2007 to achieve this. To actually get an IF(A1="", , ) to come back as true there needs to be two lookups in the same cell seperated by an &. The easy way around this is to make the second lookup a cell that is at the end of the row and will always be empty. Well so far this is the best I could come up with. It uses the ISBLANK function to check if the cell is truly empty within an IF statement. If there is anything in the cell, A1 in this example, even a SPACE character, then the cell is not EMPTY and the calculation will result. This will keep the calculation errors from showing until you have numbers to work with. If the cell is EMPTY then the calculation cell will not display the errors from the calculation.If the cell is NOT EMPTY then the calculation results will be displayed. This will throw an error if your data is bad, the dreaded #DIV/0! Change the cell references and formula as you need to. The answer is positively - you can not use the =IF() function and leave the cell empty. "Looks empty" is not the same as empty. It is a shame two quotation marks back to back do not yield an empty cell without wiping out the formula. Not the answer you're looking for? Browse other questions tagged excel excel-formula or ask your own question. Excel - How to leave cell blank instead of 0? Excel: why the value of a blank cell is zero? How to get what excel cell is showing?